I had the privilege of spending a couple of hours with Marcus Martinez (aka @kettlebellexercises) and gained a deeper understanding of his approach to kettlebell training and an appreciation for his boundless limits to creativity. As Master Kettlebell trainer for Kettlebell Kings, Marcus has developed extensive kettlebell programming and, as you can see from our workout, loves to play around and discover new ways to test the body. Building off our Six Foundational Movements, we looked at our time as a way to add another dimension to kettlebell and medicine ball training and bounce ideas off of one another. The result is some of the most innovative exercises we have ever seen using the Iron Neck. All Iron Neck training is built off of our Six Foundational Movements. Mastering these is the first step on everyone's journey with Iron Neck and essentially teaches you how to use Iron Neck most effectively based on your specific training goals. The Locked Neck Body Turn, paired with a kettlebell hold, was the first movement we incorporated with the Kettlebell. Whether you see this as an Iron Neck exercise with kettlebells or a kettlebell exercise with Iron Neck on, it's clear that 1 + 1 equals far more than 2. Buckle up. From there on, the creative juices started to flow. Marcus knows his way around kettlebells so my goal in working with him was to help guide him through his own exploration. "The deeper into the workout we got," Marcus said, "the more comfortable I felt experimenting." Watch how the idea of kettlebell shrugs evolves to include Look Left Look Right movements to create a multi-faceted, dynamic exercise. This is an incredibly dynamic core exercise, which we first saw Joe DeFranco incorporate with MMA fighter Micky Gall last year. What I love the most about kettlebells is the fluidity with which they are moved throughout a complex. In this 30 second video, you can see how the idea of one exercise (alt single kettlebell press) evolves into a completely different exercise. Working through these exercises was a very raw process that we ultimately let take form by getting out of our own way and just moving freely. It's important to learn along the way. With the entire kinetic chain engaged, you're getting feedback in the moment and can quickly correct form. Marcus's ability to identify and make these corrections is undoubtedly the product of years of kettlebell training. After working with the Kettlebell, we worked through a few medicine ball exercises. While kettlebell work is done with more fluidity, working with the medicine ball allows for more explosive and eccentric training. 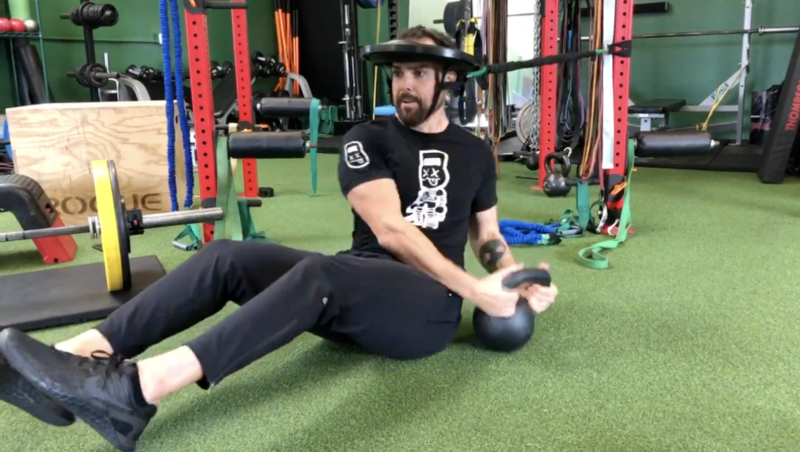 As with many of these exercises, you'll notice that I have Marcus perform an exercise while keeping his head and eyes forward and then change to keeping his eye on the medball or kettlebell as it rotates around his body. Incorporating a vestibular component to these exercises adds another dimension to the training. These are perfect for athletes that compete in any type of rotational sport like baseball or golf. The ability to train the neck and core from different angles while developing core rotational power and speed benefits athletes across all sports. The anterior muscles of the neck are the weakest (which is why you see so many injuries from the backs of heads hitting the ground). Strengthening these muscles at varying angles as you shuffle side to side while performing an upper body throw, integrates a host of functional elements into a single exercise. "My head feels like it's floating"
We kept the cameras rolling in between exercises. Marcus shares his thoughts, which echo many first time user impressions. "It feels like a pump but not a pump where I'm exhausted," he explains. "It's like a pump where I activated and stimulated everything. It's crazy. It feels amazing." Here were his thoughts after the Locked Neck Body Turn + Kettlebell complex. "I could feel everything firing"
Following the medicine ball series, Marcus reflects on how it transforms what's often an easy kettlebell exercise into an incredibly challenging accomplishment. "You can feel muscles I've never felt before," Martinez explains. "I felt like I was working in all these different angles and it just felt good. It made the movements, like a double 16k press which is nothing but all of a sudden, I'm rotating while I'm doing it, I could feel everything firing, from my shoulders up everything was firing." It sounds cliche, but with Iron Neck you truly are limited only by your creativity. My experience with Marcus today broadly expanded my perspective on kettlebell training and has inspired me to further explore the potential of kettlebell with the added dimension of Iron Neck. My hope is that the dialogue Marcus and I have started and shared will seed the desire to explore and innovate far beyond the surface we scratched today. Iron Neck is for the thousands of thirsty minds who are destined to explore their own potential with this tool.